C major guitar scales patterns. GuitarMaps are a simple way to develop a better vision of the whole guitar fret board, allowing you to play solos anywhere on the guitar neck. 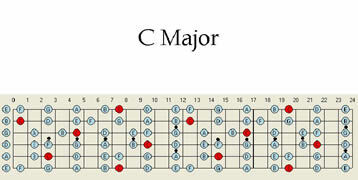 Guitar Maps connect C major guitar scales together so you can follow them up and down the fret board. The Universal guitar maps can work for songs that are in a Major keys.